Old DOS programs seems to be critical and do not run anymore under Windows. So the users ended up with some beloved programs and games that became useless. Luckily Linux offers DOS emulators. The user must be in the games group . If necessary do gpasswd -a <USER> games and log out and in. Then emerge dosbox and you can launch it by dosbox to get a dos windows where you run on the Z: drive. The command exit closes the window. In the path the / character as in Linux need to be taken. The path starts from the working directory. So ~/<directory> is a good way the define where C: is. brings now the dosou can mount any directory as the DOS C: drive. Then type dosbox -conf dosbox.conf to get it used and running. 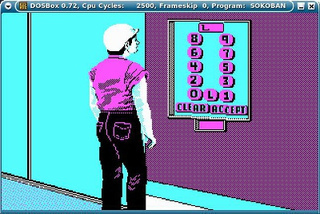 The classic Sokoban game from 1984 with amazing 4 color CGA graphics (black, white, magenta, cyan) runs well under Linux! 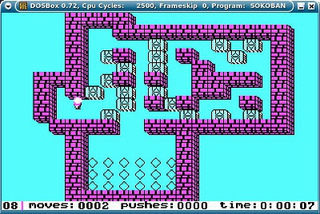 DosEMU emulates a PC under Linux, where MSDOS or an other DOS as FreeDOS can be installed. An other solution is FreeDOS http://www.freedos.org/ or http://www.fdos.org/. CD ISO image or floppy images can be download. Such floppy or CD images run well in virtual machines under Linux. See the floppy chapter how to run an floppy image without having a physical floppy. Note there is also openDOS that might be an alternative to FreeDos. 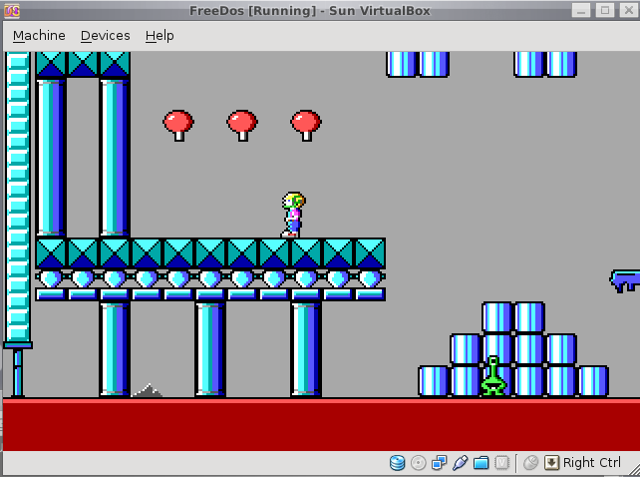 Freedos can run well in virtualbox, so you can create a pc to run your historic programs. Luckily freedos under virtual box support CD's, so you can create a cd iso image and have it read by free dos, this way you can move data to this historic environment. Ctrl+Alt+ Delete frees the cursor in Virtual box.